My friend and I went to Cajun Seafood today. We ran into someone he sort of knew, and she was trying to meet her friend there for a lunch date. She recently moved here and didn’t know there’s a million places named Cajun Seafood in New Orleans, so she told her friend “meet me at Cajun Seafood” and he ended up at an entirely different restaurant. Not all Cajun Seafoods are created equal! This one was on North Claiborne and is my favorite. It’s the one you can see from I-10. I normally try to use this blog to shine a small digital spotlight on places that I think don’t get enough credit for having delicious food – but this Cajun Seafood gets plenty of action and deserves a blog entry anyway. There’s almost always a big line, and it usually moves pretty fast but I still wouldn’t come here if I was in a hurry. Ancient New Orleans Hangover Cure, Busch beer and Yakamein. Lots of stuff is good here: it’s my go-to for boiled crab and crawfish. I’ve never tried their po-boys but it’s almost always where I go when I am hungover in the morning and need some yakamein to power through. The best deal is getting a hot plate with shrimp fried rice and 2 sides for 5.99 + tax. 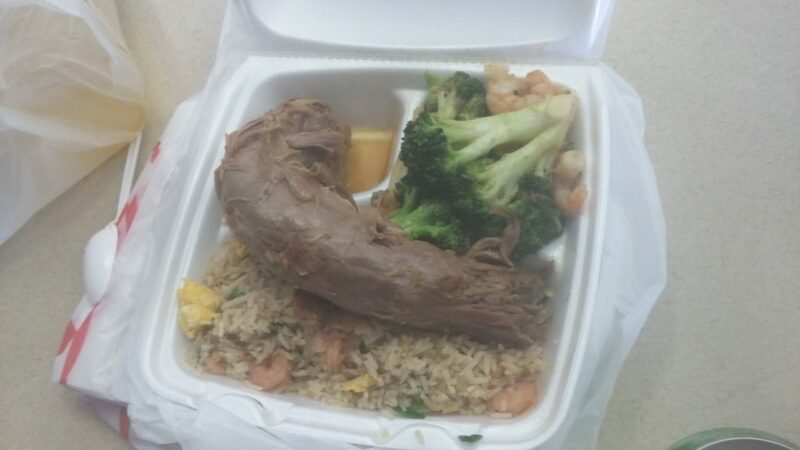 Boiled stuff counts as a side so we got a turkey neck and shrimp with broccoli with a big heap of fried rice. Sometimes when you get a cheap plate with fried rice you feel kind of cheated that most of the food is this crappy rice with a few token shrimp thrown in, but this rice really delivers. They don’t skimp on the egg or green onion and the shrimp are super fresh and taste like they’ve never been frozen. It’s maybe tied with the Orange Store’s shrimp fried rice as my favorite, although LB Saints fried rice is real different but maybe equally as good. The shrimp with broccoli is good, if a little sweet for my taste. When I get hot plates I feel like I have to throw in some kind of vegetable, so that I can pretend my eating habits are half-way healthy. Textually, the broccoli excels. It’s not mushy but not hard, and the shrimp are big and bursting with flavor. The turkey neck wasn’t as tender as they usually are here, but wasn’t rubbery like at some places. The later in the day, the better the turkey necks are I think. At a different Cajun Seafood I went to the necks were kind of bland, but this one has just the right amount of spice. They’re also huge. It’s a great amount of food for $5.99! We also got a shrimp yakamein. I have great luck with yakamein here, I’ve had it probably fifty times and this is the first time it’s been bad. 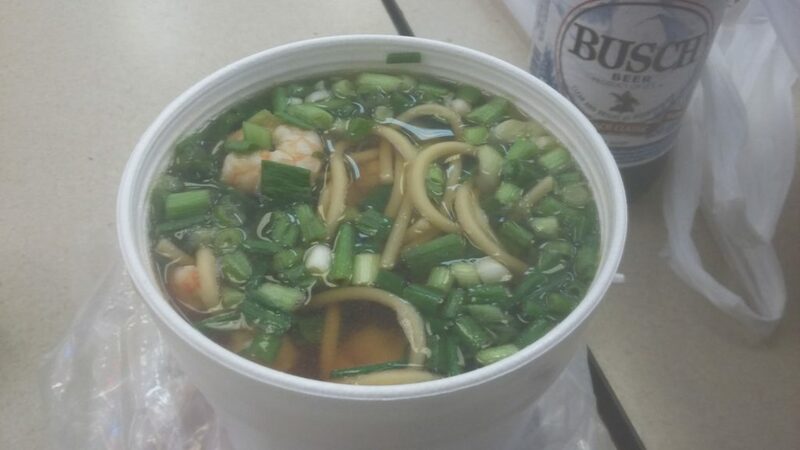 The noodles were good, the shrimp was fresh, the boiled egg was good, and they loaded it up with green onion, but the broth was so thin! I ate it anyway but it was disappointing. Still, I think it’s worth trying the yakaemin here – 1 out of 50 times being bad, and 49 being delicious, that’s pretty good odds. 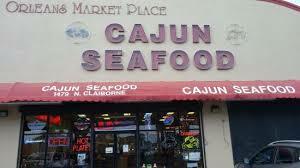 If you’re in New Orleans, you gotta go to a Cajun Seafood, and if you gotta go to a Cajun Seafood, go to the one on North Claiborne!